Although the features of the new block editor are quite appealing, the majority of WordPress users prefer the classic editor. Consequently, many have switched back to the old editor. If you’re new to Gutenberg, you’re bound to get stuck. You must find it harder to use as a beginner. There are still many issues in it. Among them, the linking problem is a notable one. 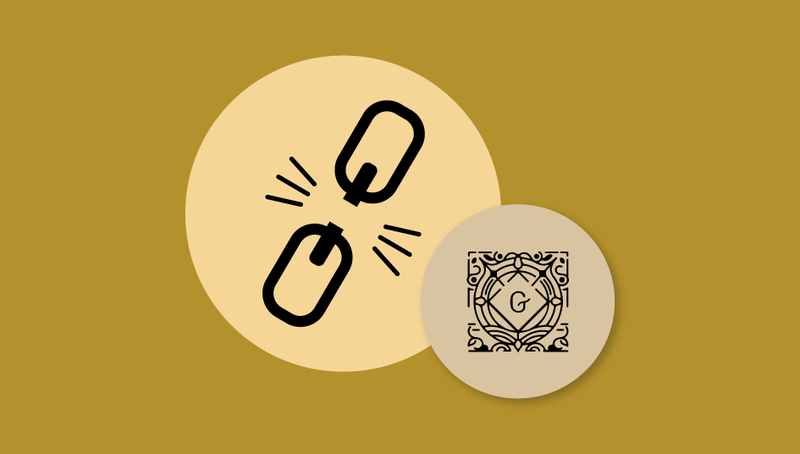 You can only add a nofollow link in Gutenberg manually. Yes, you heard it right! 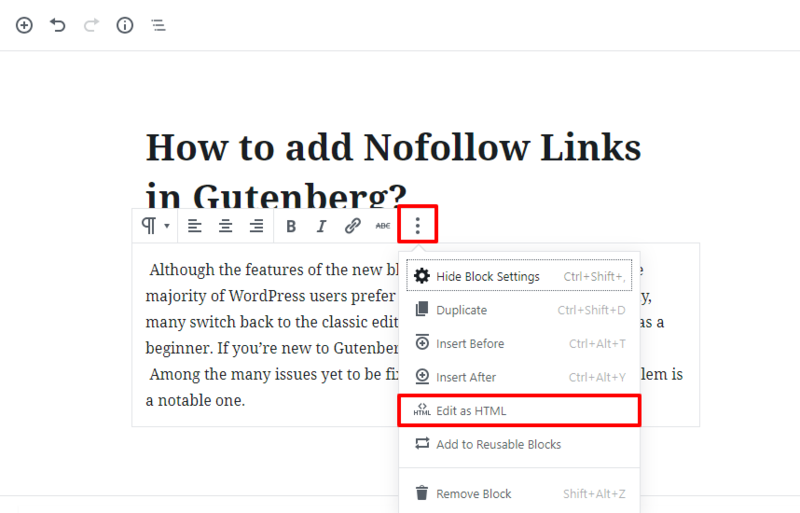 Even though WordPress Nofollow Link Plugins are available, they don’t work in Gutenberg. Till the present date, no plugin can provide a direct solution to this. So, you should learn how to nofollow a link in WordPress without a plugin. Even if you are a beginner, you must be familiar with the use of a Nofollow link in WordPress. Just keep reading to learn what nofollow is and how to create a nofollow link in WordPress block editor. And it’s easier than you think! Firstly, you need to know the structure of an HTML hyperlink tag. Whenever you add a link in your posts or page, WordPress adds HTML tags like this. Nofollow is a value you add to the rel attribute of the hyperlink tag. The rel attribute shows the relation between your page and the linked page. And adding Nofollow means you don’t trust the link. Currently, WordPress adds NoOpener and NoRefferer values to rel attribute automatically when you set the links to open in a new tab. NoOpener is good cause it prevents the site you’re linking to take control or make changes to your page. These tags make your site less vulnerable. But, WordPress doesn’t add Nofollow automatically. Why do you need Nofollow links? If you have some idea about SEO (Search Engine Optimization), you must know about Dofollow and Nofollow. Also, you must understand the importance of backlinks in the ranking of a site. 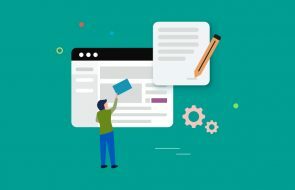 WordPress links are Dofollow by default. It tells the search engines to crawl and index the linked page which passes the link juice. Crawl prioritization: Adding Nofollow to your links instruct the Google bots not to crawl them. You can add Nofollow to your pages which search engines don’t need to visit. Untrusted sites: When you’re not sure of the validity and reliability of the linked page, add Nofollow. It shows you don’t trust the linked site’s content or authenticity. Paid/Affiliate links: If you don’t want paid links to influence your search results, you can add Nofollow to these links. It’s easy to add a Nofollow link in the old editor because of the plugins. But in Gutenberg, you must add it manually. You may think messing with the code is tough, but it’s not. To find out, follow the simple instructions given below. 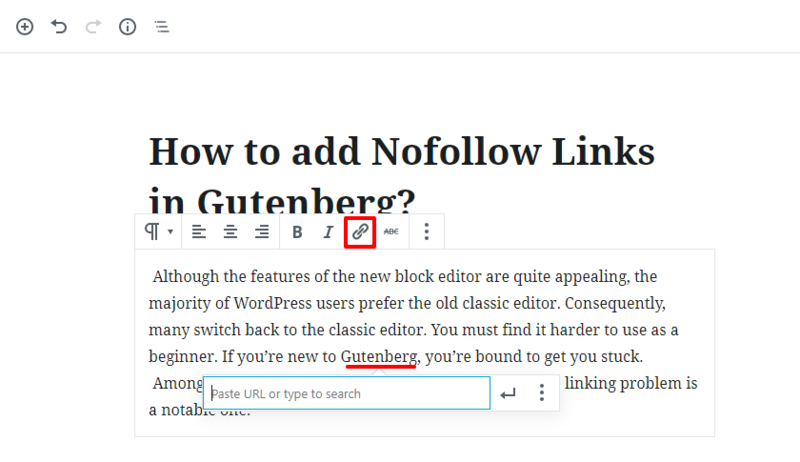 At first, select the text where you want to add the Nofollow link in Gutenberg. Click on the Link icon in the block editor. And, copy the URL of the page you want to link and paste it in the box. Then, click on the Link Settings and click the Open New Tab option. It adds target=”_blank” attribute. You should do this for all your outbound links. Also, it prevents the readers of your site from drifting away. Click on the Block Settings icon and click on Edit as HTML. Now, you can see the content in HTML. There’ll be a hyperlink tag where you added the link. As you can see, norefferer and noopener values have been added to the rel attribute already. Just add nofollow with them. Keeping them together doesn’t affect the Nofollow link. But for affiliate links, you can remove norefferer as it doesn’t let the linked party know about your referral. And that’s it! Thus, using Nofollow links in WordPress is essential. It makes your site reliable and trustworthy to the viewers and search engines. Adding Nofollow links wasn’t a big issue in the old editor. But after the new editor update, many WordPress users get lost. 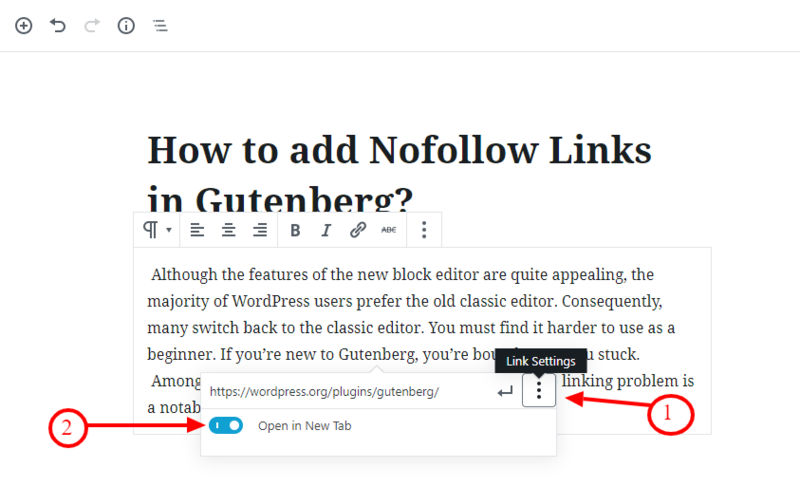 We hope after reading this article, you can create Nofollow links in Gutenberg with ease. 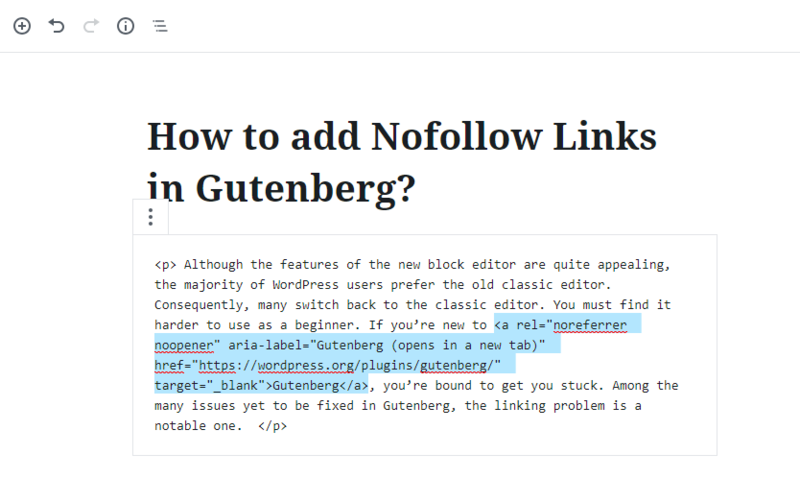 Some WordPress users might still be struggling to add a Nofollow link in Gutenberg. Share this article and help them out! 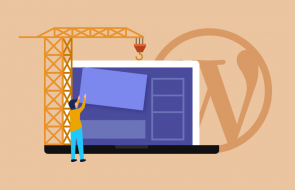 How to Create a Website from scratch using WordPress Page Builders! Your note was useful. Thank you for writing!